You are here: Home / Animal Attacks / Lucky Leap for Taunted Tiger? Take one top level predator, add adrenaline, and a lucky leap and you have deadly consequences–or so goes my theory. The San Francisco tiger attack that left one victim dead and two injured is nothing to joke about. We all send our condolences to the surviving family and all those impacted by the incident. In between our pondering on the rest of life, foremost on many animal lovers’ minds is, what will the critter crime scene investigation reveal? After spending a lot of time on the phone answering questions about the tiger escape and attack on zoo visitors on Christmas Day, I decided to think out of the box. In most cases, captive animal attacks are from human error. Errors that include poor judgement, failure to lock a gate or door, entering a dangerous animal den while the animal is still in it, breeching barriers, or ignoring warning signs given by an animal until it is too late. Somtimes the reason is to design flaw or equipment failure. I remember one zoo exhibit where the lions had to remain locked up after any incliment weather because the dirt piled up at one end of the enclosure, raising the ground level and reducing the perimeter barrier height so that the cats could get out if they had enough motivation. But could there be another reason for the tiger escape in this incident? After all, predators have DNA that is coded for hunting and killing. This requires cunning and strength but would it be enough to launch over a deep moat and up and over a wall that is 20 feet high? Maybe it would be if you are a tiger in her prime, with the strength estimated to match that of 13 humans, and enough adrenaline in her system to act on her instincts–with deadly consequences. 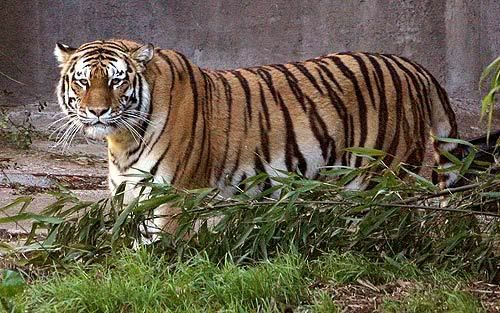 Zoo visitor behavior is not always the best, although the jury is still out on whether or not the zoo visitors taunted Tatiana, San Francisco Zoo’s Siberian tiger–there is a chance they did. In zoos internationally, people attempt to entertain their kids by visiting zoos. Outside of when I interned or worked in zoos, I toured exhibits regularly, and spent long periods of time watching animals. But most visitors spend minutes, if not only a few seconds, because they find zoo animal behavior notoriously boring. Zoo animals often rest or slowly amble around the exhibit, unless you watch closely, so to get them to “do something,” people jeer, throw things, run back and forth, or climb over barriers, and even into enclosures to get reactions. Did the frustrated feline have enough adrenaline in her system to give her the extra juice to make a lucky leap? It could happen, not likely, but it could. Animal escapes in time of stress occur–like antelope leaping out of the enclosures after thunder and lightening. Don’t forget that unbelieveable feats of great strength have been reported in humans–why not tigers? So did the boys taunt the tiger? Did the unfortunately victim get caught by the tiger because he was dangling something (or himself) over the moat thinking he was playing with a simple housecat? Teasing animals is a bad idea and maybe those type of actions only enticed and motivated the tiger to make an attempt to stop them. If all three boys were together perhaps the other two ran while she grabbed their buddy…and then tracked them down. We don’t know and all we can do is speculate. Hopefully, the investigators will have an answer soon. Once I heard of this event, I was eagerly awaiting your comments on the issue. How high/far can tigers and other large cats leap? Surely someone has some data on that? What role does an animal behaviorist play in an investigation like this? Would you be asked how an animal *could* respond, or how it *did* respond? With so little observation to go on in this case it seems like the animal’s story would be difficult to figure out. Good question Andrew, I have posted the verified statistics on the blog–tigers can jump from 16-19 feet and up to 32 feet according to two industry publications. As to the role, my degree is in exotic animal training and management and also behavior and conservation. Since I have been witness to multiple animal attacks, they look for people with experience to comment. I also was up on a consultation for Tony the tiger up at San Francisco Zoo so am familiar with the facility. Behavior is pretty predictable and although speculation always must be be confirmed, you can assess situations and give them an idea of what the animal’s responses and physical capabilities can be.